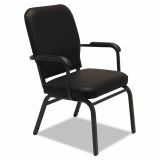 Alera Oversize Stack Chair with Arms, Black Anitmicrobial Vinyl Upholstery, 2/Carton - Heavy-duty chair with built-in lumbar support is designed to accommodate larger guests up to 500 lbs. Extra-wide seat with waterfall edge has a 3-1/2" foam cushion for all-day comfort. Durable 18 gauge 1" steel frame with front and back stretcher bars for added strength. Stacks up to five high for space-efficient storage.